If you have been reading this blog and following me for a while you know that I do my best to make sure what I wear has a light touch on the planet and its people. In fact, you might even know that five years ago I stopped buying new clothes in order to minimize the environmental and human damage that results from my engagement with fast fashion. I have been purposefully creating a mindful wardrobe of only handmade or secondhand clothes and I am inalterably changed by this path. You can read more about it here and here if you want. The fact is, I try to be deliberate and thoughtful about what I wear and those same values guide how I assemble my espadrilles kits. 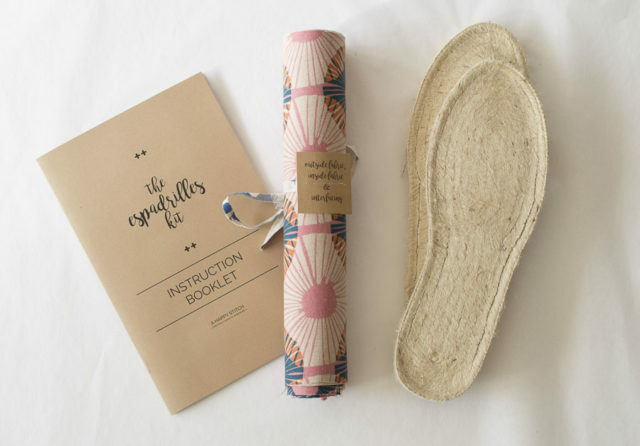 From time to time, though, I get a gentle nudge along the lines of “you are so good about your clothes but what about your kits?” So it seemed important to look closely at eco-responsibility and the espadrilles kits. Similar to my mindful wardrobe, my kits are not perfect. It’s a conversation for another time, perhaps, but I maintain there is value in an attempt that balances the pressures and joys of real life with working toward a better relationship with the earth and global workers. The Espadrille Kits are a mix of fabulously environmental and ‘the best I can do’ with the constraints I have. In all honesty, I really thank everyone who has pushed me on this question. Thank you for asking and for digging deep. I find it reassuring that we, as a maker community, are out there asking about the origin and source of our crafting materials. It makes me better to be held accountable. Everyone who has approached me has done it with such kind respect and that means so much to me. That said, we live in a culture of perfectionism and gotcha-ism. I completely understand how easy it is to fall into the trap of environmental perfectionism a la ‘unless everything you wear is fully compostable, everything you do is meaningless!’ I have fallen into that myself too many times and I’m really thankful to be surrounded by people who have inquired with sincere interest and concern. Efforts to care for Mother Earth and for each other are not a competition. Yet, when we are learning ourselves, it’s easy to use our knowledge and efforts to pile shame onto others who are just starting out. I keep this idea in my head of a purity test and I’m always on alert for people more interested in testing the purity of someone’s efforts than in working together to change. I find it exhilarating when I get stand and learn with people hoping to make a difference. I find it discouraging when I stand alone scrutinizing my every move. After all, if everyone did a little we would be far better off than if one person lived a perfectly footprint-less life. I have brought this same philosophy and careful attention to creating my espadrilles kit and want to be as transparent as possible. I am very proud of them but the kits do not have a simple label like “organic” (then again, even that label isn’t truly simple, is it?). So here goes! Let’s get into it. 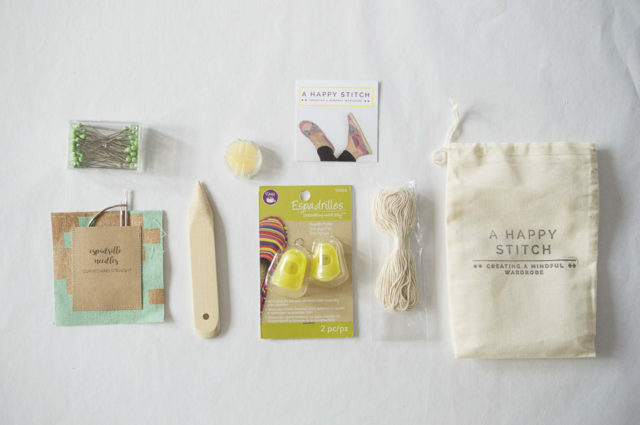 With a few exceptions, each kit comes in a box covered with tissue paper and includes a shoe pattern, my instruction booklet, manufacturer instructions, a bag with needles, pins, a point turner, wax, needle pullers and espadrille thread. It also includes the shoe soles (of course) and canvas fabric, cotton lining fabric and interfacing. I offer a variety of kits so some do not include the fabric or other various items but to be thorough I’ll talk through each piece anyway. Let’s start by walking through the booklet, the fabrics and interfacing and the shoe soles. By the way, the shoe lining fabric and interfacing always come rolled up inside the outer fabric so they aren’t visible here but are in the picture, so to speak. + Instruction Booklet: Written and illustrated by me, the booklet is printed at a local print shop where I work with an amazing woman named Doris to create them. I need to work one-on-one with someone to get them to look exactly the way I want. I also want the booklet to be easy to to read and able to sit open alongside you as you sew. Because I work with a local print shop, it is not printed on recycled paper. I chose working locally over going recycled in this case. On the upside, I am able to pick up the booklets myself and avoid the environmental damage incurred by shipping heavy boxes. Tucked inside of the booklet is the shoe pattern and manufacturer instructions both of which are printed on conventional newsprint-like paper and sent with the shoe sole from the Dritz Company. + Fabrics: The outside canvas fabric is not organic but the lining fabric is, whenever possible. Most of my canvas or thicker outer fabrics comes from Cotton + Steel because I like their designs and they happen to have designs at the right sized scale for espadrille shoes. (Finding fabric with the right scale is harder than you would think.) This fabric is shipped to me from California but is manufactured overseas. The lining fabric is organic and comes from Cloud 9 Fabrics , which is located just about 20 minutes away for me so this also doesn’t require shipping. The organic fabric is also manufactured overseas. + Interfacing: The interfacing comes from a wholesale distributor so it includes shipping and isn’t an organic product. I don’t have any idea how to do a more eco-friendly interfacing but the shoe definitely needs the support of interfacing to be functional. 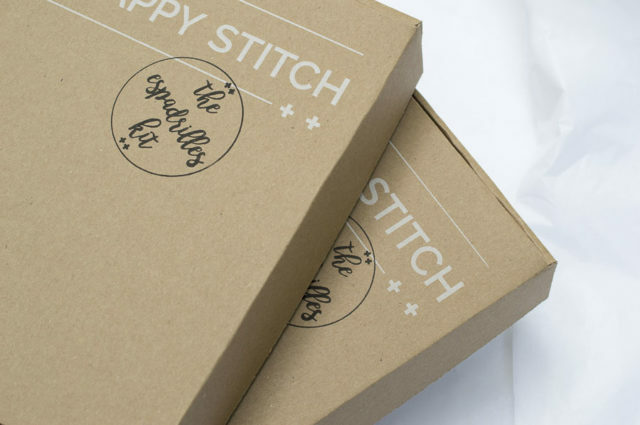 + Fabric Tie: I design and print the label on Kraft paper and then sew it onto strips of canvas that end up as remnants after cutting up the fabric for kits. + Shoe Soles: The shoe sole gets a bit complicated so stick with me. They come from the Dritz Company and are shipped to me but I placed a big order so it was only two shipments from South Carolina to me in a big truck. (It is a wild day when a big pallet shows up!) They are made of jute, rubber and glue and are originally made in China. The Dritz company, however, no longer makes shoe soles and will not be ordering any more from China. They only have what remains in their warehouse so purchase of these shoe soles does not create demand for additional shoe soles from China. It’s an inventory situation that companies call ‘run down’. If they had stopped selling espadrilles, eventually they would have been tossed. Instead they are sitting in my basement. So, rest assured, when an espadrilles kit is bought from me you are not supporting increased manufacturing in unknown conditions in China. When I run out of shoe soles I will be re-supplying with soles made in Spain (where espadrilles originate from). The Spanish soles are decidedly more expensive but it’s an investment I’m excited about. + Glass-Head Pins: The pins are originally from the Czech Republic but came to me from the Dritz Company. 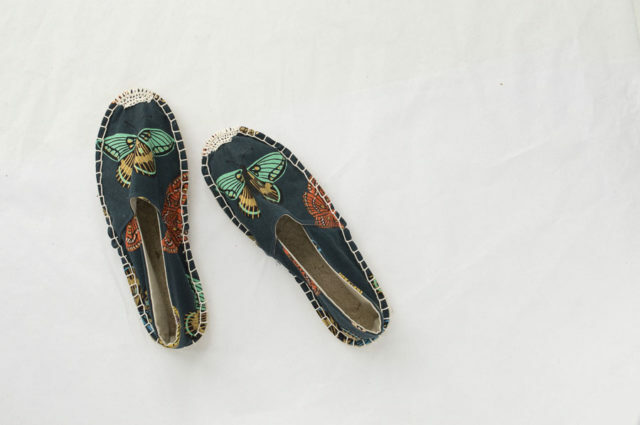 They are a part of the same discontinued line of items designed for espadrilles. I love that they are useful for so much beyond making espadrilles. + Espadrille Needles: These over-sized needles are also from the Czech Rebuplic via Dritz. I create a handmade envelope made of Kraft paper I print in my studio and then sew on to a square of leftover canvas fabric. + Point Turner: This bamboo point turner comes from China via the Dritz company. It is another tool that can be used over and over again and is part of the whole discontinued group of tools. + Espadrille Wax: This vital little bit of wax comes from Taiwan. It’s also a Dritz item and this size is discontinued although they sell other sizes of wax. It’s enough wax to be used more than once and is made of beeswax. + Needle Pullers: Same story with this item from Taiwan. I received it from Dritz as part of their line of discontinued espadrille items. + Espadrille Yarn: Originally from China, this specialized yarn comes from Dritz and is also discontinued. Often people have extra yarn leftover and it’s very useful for additional purposes. + Business Card: My business card comes from Moo.com so it is shipped to me. It’s made of 100% recycled t-shirts and I try to buy a lot in each order. I wish my local print shop had recycled t-shirt paper because this stuff is fabulous! + Hand-stamped carrier bag: All of the accessories fit back into this little cotton drawstring bag. Sadly, the bag is not organic. 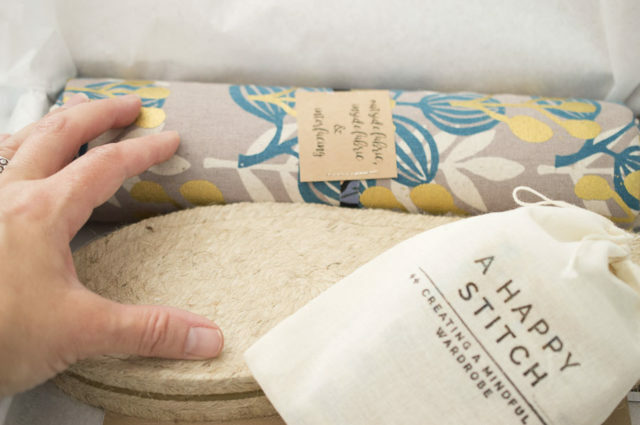 Organic cotton bags were 300% more expensive and fewer shipped in each order. I didn’t want to over-inflate the price of the kit by ordering organic and really wanted a reusable bag so I compromised with these. I got these on Amazon. I stamp each one with a rubber stamp ordered from Fairmont and Grove on Etsy. The ink pads I use to stamp them use a small bottle of refillable ink so I can reuse the stamp pad again and again. 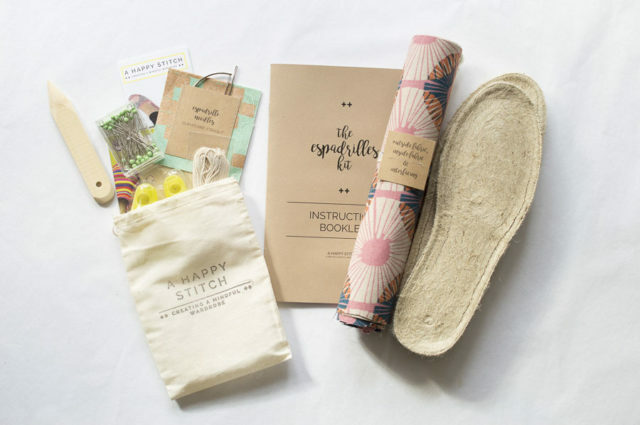 With the exception of the business card and the cotton bag, all of the supplies come with their own store-ready packaging. I don’t find the packaging attractive or necessary so I usually remove it. I also don’t like receiving something in a big box that has loads of packaging I have to take care. I’d rather send you less junk to deal with in a smaller box. I always recycle or reuse whatever paper and plastic I can. That covers everything that goes inside the kits. As you can see, I have been uniquely able to limit the demand for additional manufacture of small items and try to be fairly responsible when I can. On the flip side, they are manufactured all over the world and do involve some plastic packaging. Boo. 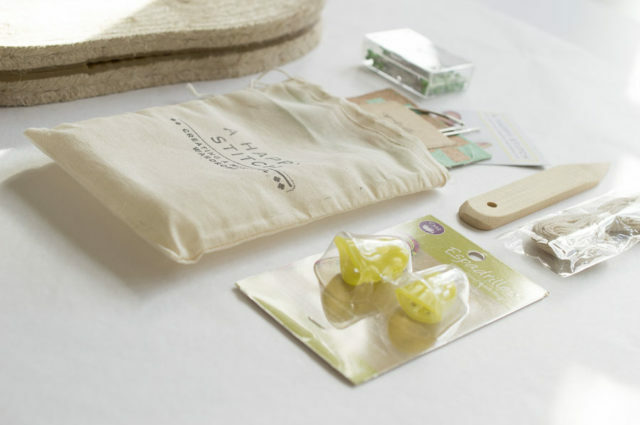 There are also a few additional packaging items that go into the kit. + The Box: I feel so lucky to have found the company, EcoEnclose, which can do custom branding on 100% recycled boxes. 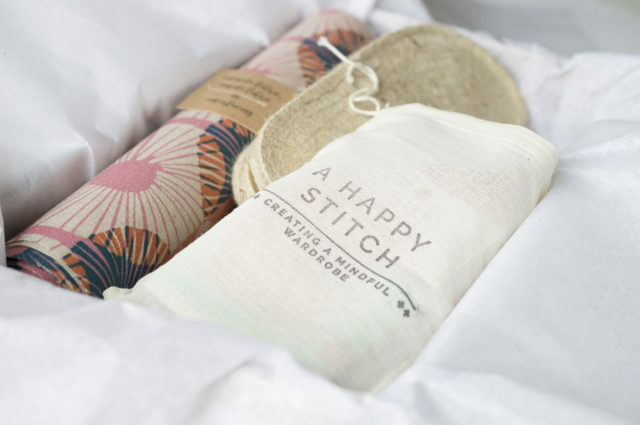 Be sure to check out their website as they offer lots of packaging options that are eco-friendly. They aren’t able to easily do two-color boxes, though, so I hand-stamp the black text on with another rubber stamp from Fairmont and Grove and the same re-usable ink pad. +Tissue paper: my tissue paper is also from Ecoenclose and is 100% recycled material that is easily compostable. + Stickers (not pictured): I use two kinds of stickers. One is a Kraft paper sticker that I buy blank and hand-stamp. (As you can tell, I get a lot of use out of my rubber stamps and ink pad). The other are stickers I ordered from Moo.com. But, EcoEnclose has just started creating stickers so I will switch to those when I run out. + Postcard (not pictures): Again, because I am picky about printed materials, every box includes an informative postcard that I designed and I work with Doris at my local print shop to create it. It is not recycled cardstock. + Handmade Notecard (not pictured): I love me a good handwritten note so I sew Kraft paper onto leftover canvas scraps and slip a little happy note into each box. The paper used for this is not recycled but the fabric is saved from the scrap bin. + Shipping labels: I use a Kraft paper shipping label made by the Ecoenclose company. As you can tell, I try to balance having everything look good and be eco-friendly with not driving up the cost so much that the kits become inaccessible. I am sure things will shift and change over time but this is the current state of my kits. I don’t have everything sorted out to perfection but my hope is that the kits are self-contained, don’t burden you with excess trash and light up the fire of creativity. Not bad for one small box. Note: This post include an affiliate link for EcoEnclose products. If you use that link you are not only helping me out you get a 20% discount. It’s a win-win! 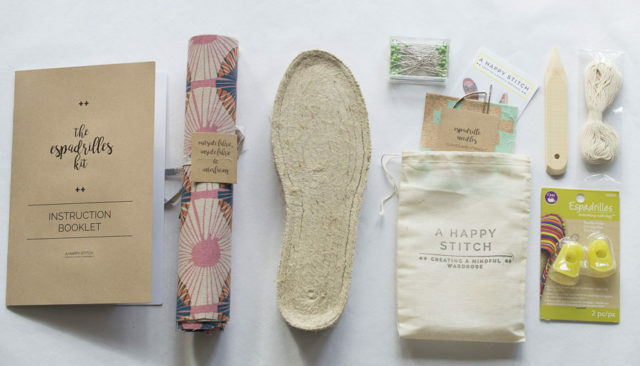 Your packaging is so well-designed and thoughtful. Thank you for stepping us through your materials and process. Thanks so much! I’m so glad it was helpful.